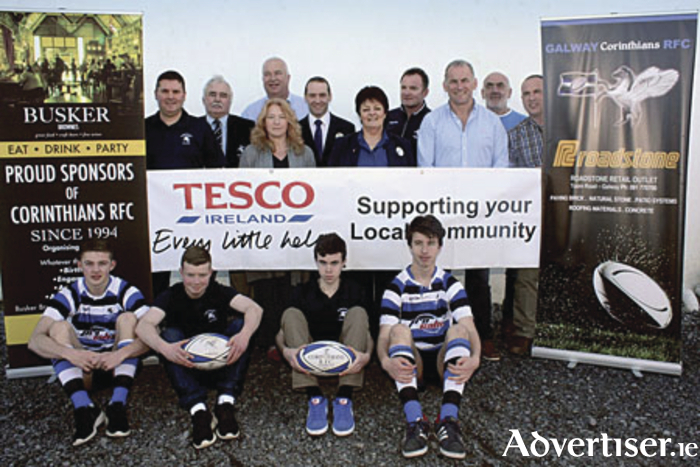 Back row, John Fitzmaurice (committee), Kieran Smyth (president of Corinthians), Cynthia O'Connor (Gap), Kieran Browne (festival chairman), Stephen Corrigan (Tesco), Geraldine Moloney (Tesco), Roy Gibson (Advertees), Eric Elwood (director of Connacht Domestic Rugby), Kieran Faherty (committee), Michael Spellman (committee). Front row, Matthew Fitzmaurice, Cillian McCarthy, Kieran Spellman, and Darragh Browne. Galway Corinthians RFC is hosting a first festival of youth rugby for all clubs in Ireland, in support of Temple Street Children’s University Hospital and Galway Autism Partnership. Expected to be the largest of its kind held in Ireland, the festival will take place on April 18/19. Round-robin action will be held on Saturday, with the quarter-finals, semi-finals and finals on Sunday. Running alongside the on-field activities are planned social events and hospitality. Both girls and boys will compete at u-15 for respective trophies honouring two well-known stalwarts, the late Joe Joyce and Joe Tighe. Both were heavily involved in the the club, Joyce having managed sides of all age groups before becoming the chairman of Youth Rugby during one of the most successful periods at this level for the club. “It is our great privilege to have this U15 National Youth Festival in honour of our great friend and Corinthian Joe Joyce,” says festival chairman Kieran Browne. Joe Tighe, involved with the referees’ association, was a champion of women’s rugby, and his name is honoured with trophies at Galwegians and Connacht. Entry to the festival, which has the backing of the Connacht Branch of the IRFU, is by invitation only. Special guests will include Connacht’s head coach Pat Lam and a number of Connacht players. Corinthians report a significant interest from clubs across the provinces. “We currently have approximately 800 male and female players signed up together with their coaches, management and almost as many parents and supporters,” says Kieran Browne of the organising committee. “Youth Rugby, as well as being a healthy and fun pastime for our youths, plays an important part of the future of senior rugby in Ireland. However, with the exception of friendly matches organised by clubs, there is no platform for clubs to play outside their own province.